For those who own a modern panel garage door, it is easy to just take it for granted. You use it every day. It will open and close everyday with no problem. However, one day there will be a problem. The door could come crashing down, simply not work, or will get stuck. If there is an emergency, you can call us anytime. We offer a 24/7 service, and we will get there the same day; nearly all the problems will be quickly resolved. A modern garage door is very much like a car. There are a number of interdependent systems that need to all work together. This way, the garage door can properly move up and down. One of these critical systems is the rollers, along with the associated hinges and tracking. The hinges attach to both the garage door panels and the rollers. The tracking is found on both sides of the garage door. The tracks themselves move the rollers smoothly along vertically, then swing up horizontally. Each panel can then effortlessly and evenly move up or down. The rollers themselves are usually made from either steel or nylon. These in time will wear and get damaged. The hinges loosen in time. Periodic tightening with a tap wrench is needed. The tracking itself can get dented and damaged. All of this will impede the smooth running of the rollers; therefore, you will need regular repair and maintenance. With the roller system, there is one thing that you can do yourself, and this applies to other components and fixings. Conduct a monthly maintenance check. Use your eyes and ears for this. 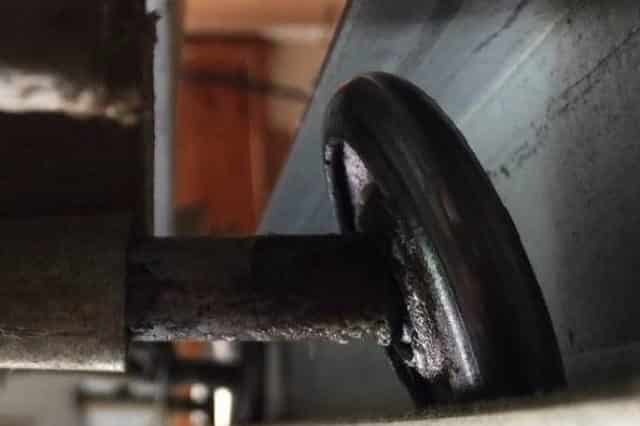 If you notice a noise starting to develop with the rollers, this means that the system is not operating smoothly and that there could be a problem developing. Do not wait for an emergency; contact us immediately at Grand Prairie TX. We will send a skilled technician who can quickly deal with the problem. It is best to replace both the roller and the hinge at the same time. They both come together as a unit. The hinge helps to connect the roller to a garage door panel plus “lock” the roller into the tracking. For your roller Garage Doors Grand Prairie TX, are more than happy to supply you with the correct fittings and components. We use Original Equipment Manufacturer (OEM) parts. We obtain these directly from the individual manufactures. We can also buy in bulk, which helps reduce the overall cost. These OEM parts are those designed to operate in each make and type of garage door. We have good contacts with all the manufacturers. 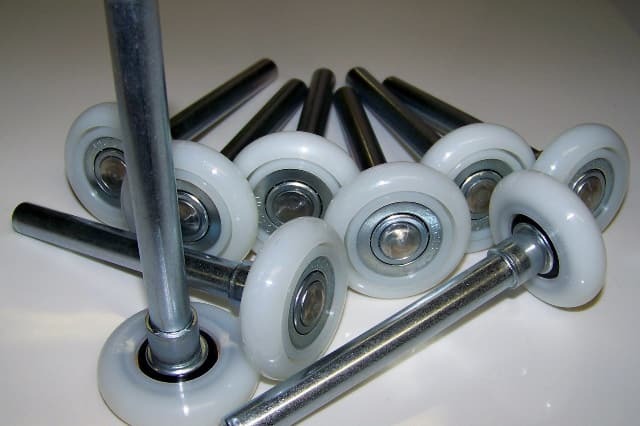 If your garage door is no longer being made, we will still stock on the correct garage door rollers and hinges for you. For a number of reasons, do not try this yourself. We have special clamps to secure the roller garage doors. There is a danger of the garage door crashing down. Our skilled and qualified technicians at Grand Prairie TX will know how to properly fix any rollers and hinges with the correct wrenches and tools. Again, we can supply the correct OEM part at a very reasonable price. Rollers are not the only important systems. Garage door springs and cables support the opener motor, which opens and closes the garage doors. Without them counter balancing the door, the opener motor could not do this on its own. These are high tension springs. Torsion and extension springs are used. These have a fixed life. All metals are subjected to a force work harden. This means that they progressively become more brittle and stiffen. Each time the garage door opens and closes, there is work hardening on the springs and cables. This is called a cycle. At around 10,000 cycles, springs and cables will start snapping. We at Express Garage Door Repair at Grand Prairie TX can predict when all your tension springs and cables will start breaking. We will then come in to replace all these components. We are also available for routine spring adjustments. If you ignore replacing the springs, there is a chance that the garage door could suddenly collapse. This could be on top of you, your vehicle, family, or pets. If you use your garage door a lot, averaging 8 times a day, the spring failure will start failing in only three years. At 6 times a day, springs will start breaking be in approximately 5 years. There is another important consideration. These springs are held under high tension. Replacing them can be a dangerous job. They can “spring” out at you, possibly causing you a serious injury. As with the garage door rollers, you will need to have the correct components . Buying them online may result in you getting inferior springs with a limited “cycle” life. This is another good reason for you to get in contact with us at Grand Prairie TX. We can set up a regular maintenance and repair routine. This will save you money and provide you with peace of mind. 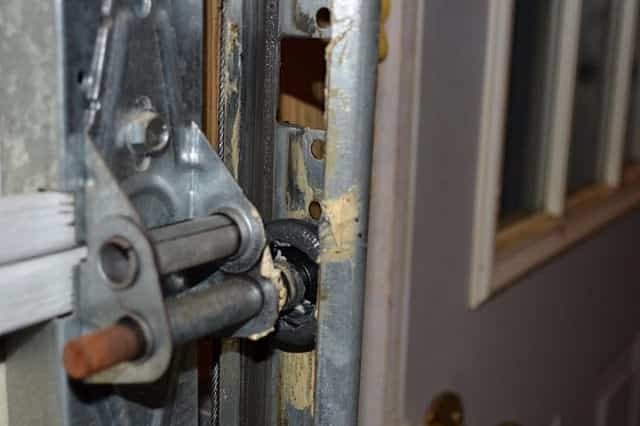 The other major garage door system, which will require regular maintenance and repair work is the opener, which breaks down into a number of sub systems. There is the main power source. If there is any problem with your power supply, call us at once. Electricity should be isolated and the garage door secured. This must be left to the experts. The drive mechanism consists of a drive system. This is usually either a chain, belt, or a gear system. As these are mechanical systems, they will be subjected to wear and possibly damage over time. Gears, cogs, drive belts, fixtures, and fittings will need periodic replacements. Lubricating and tightening up of parts should be regularly undertaken. We can come and visit you regularly. Twice-a-month inspections may be needed. Also, the “photo” eye often gets out of alignment with the remote.